I was a kid experimenting in my parents kitchen long before I was brewing beer and making elaborate foods as an adult. I was eight or nine years old the first time I attempted to make candy. Not understanding that I should take a small amount and see how it reacts, nine year old me took the entire 5 pound mass of peanut butter, sugar, and corn syrup at 258F degrees and dropped it into a giant bowl filled to the brim with water and ice. The resulting explosion of steam, glass, and peanut flavored sugar looked like something Willy Wonka would create if asked to do the set design for a movie about Mount St. Helens. Failure tends to be the best teacher, and my taffy failure taught me to put more thought into my culinary processes. The lessons learned also led to a lot of great kitchen successes. Later that year I actually had my own small baking company up and running (now with improved adult supervision! ), and used the money earned to send myself to summer camp and buy Sega Genesis games. Those childhood experiences in the kitchen have stuck with me my whole life, and probably set me on this path of brewing and cooking as an adult. I’ve still never reattempted to make peanut butter taffy though, but who needs taffy when you have chocolate beer truffles? You won’t believe how easy it is to make chocolate truffles at home. 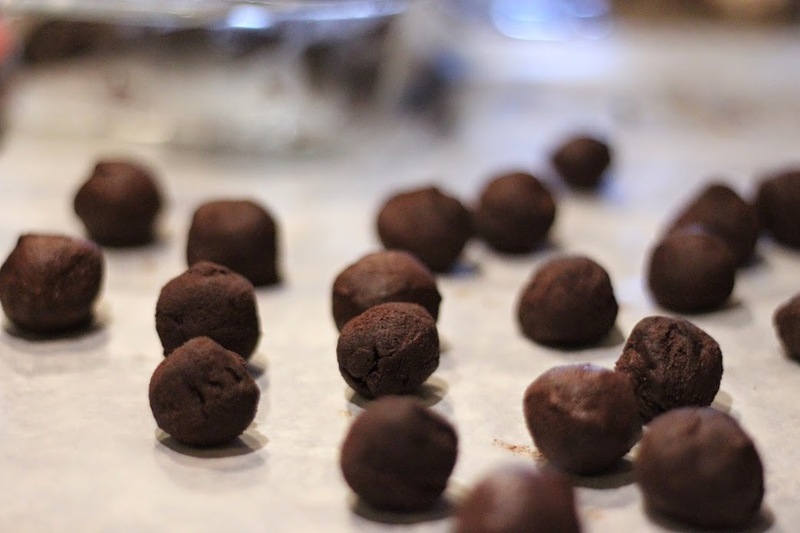 With $30-$40 in ingredients and a few hours time you can make over a pound of incredibly delicious truffles that would cost over $100 in a store. Once you get the hang of it you can experiment with ingredients or toppings to make something incredibly unique. These truffles are made with Flying Dog’s Kujo Imperial Coffee Stout. The beer has 8.9% ABV and tastes of strong roasted malt and coffee that is surprisingly well balanced by the sweet dark fruit flavors and creamy body. This beer is reduced down in order to really get the flavor into the dark chocolate that goes into these truffles. Vanilla is then added to smooth and balance the flavors of the chocolate and beer together. 1. Heat the beer in a small pan until reduced to 1/4 cup. It’s ok to let it simmer lightly, but do not let it boil. 2. Use a serrated bread knife to saw the bittersweet chocolate into fine shavings. Place the shavings into a mixing bowl. 3. Split the half of a vanilla bean down the center and scrape the insides of the bean into the bowl of chocolate shavings. Mix well. 4. Heat the cream in a small saucepan until it just begins to simmer. Pour the cream over the bittersweet chocolate and slowly stir with a rubber spatula until smooth and creamy. If the chocolate doesn’t melt completely then put it in the microwave for 10 seconds then slowly stir again. Repeat this until completely melted. 5. Gently stir in the reduced beer. Pour the mixture into an 8×8 glass baking dish and place in the refrigerator for 30 minutes. 6. Meanwhile prepare the outer coating with the semisweet chocolate. 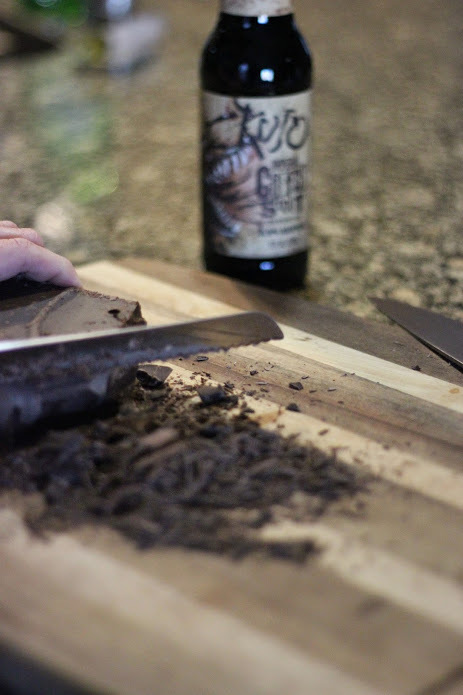 Use a serrated bread knife to saw the semisweet chocolate into fine shavings. Place the shavings in a mixing bowl. 7. 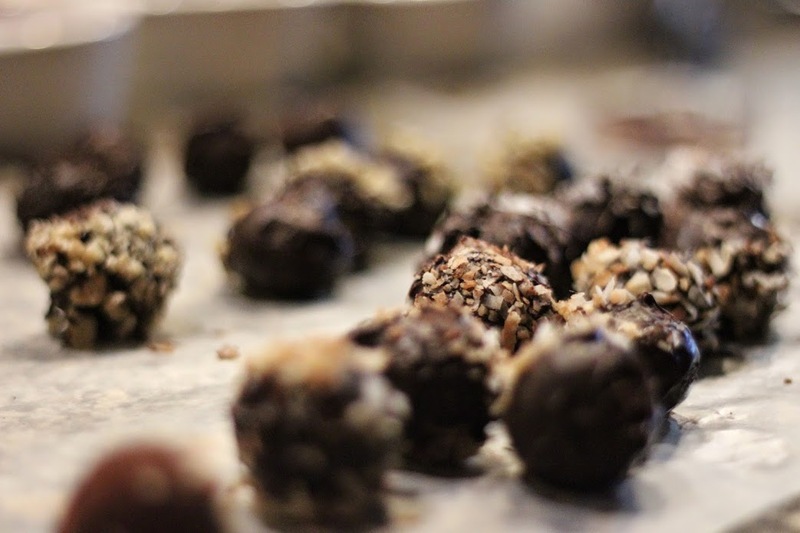 Take the chocolate beer mixture out of the refrigerator and roll into several small balls. Place on wax paper on a baking sheet and return these to the refrigerator. 8. Place your toppings into small bowls or ramekins and line up for dipping. 9. Place the semisweet chocolate shavings in the microwave for 10 seconds. Remove and stir gently with a rubber spatula. Repeat until completely melted. NOTE: Be very careful at this point and work slowly. The texture of the chocolate will be ruined if heated to 94F or higher. 10. Remove the chocolate balls from the fridge. One by one roll them in the melted chocolate, then roll them in a topping or sprinkle a topping over the truffle. For additional variety you can skip dipping all of the truffles into the melted chocolate. 11. Let sit for a few minutes so that the chocolate shell becomes more firm. 12. Pour yourself a beer and enjoy your creation! Next Pints for Paws Raises over $7,000 for the SPCA!